Posted at 2:54 pm by Yummytums! The simple act of farming – even on a small scale – creates a whole new appreciation of food. Even the lowly potato becomes more enticing when you have to dig it yourself! I discovered this first-hand last weekend, when I dug my first crop of potatoes. It was a sweaty, exhausting job and I have the blisters to prove it. But my reward was two five-gallon buckets of red and Yukon Gold potatoes. My parents typically grow the Kennebec variety, but I wanted to try Yukon Gold because I love the creamy texture and buttery taste. It turns out that Yukon Gold produces well in Kentucky, as does the red potato variety. I have to say that planting potatoes in the spring is much easier than digging them in the fall. In fact, apart from mounding the dirt around the plants, the whole planting process was a breeze. 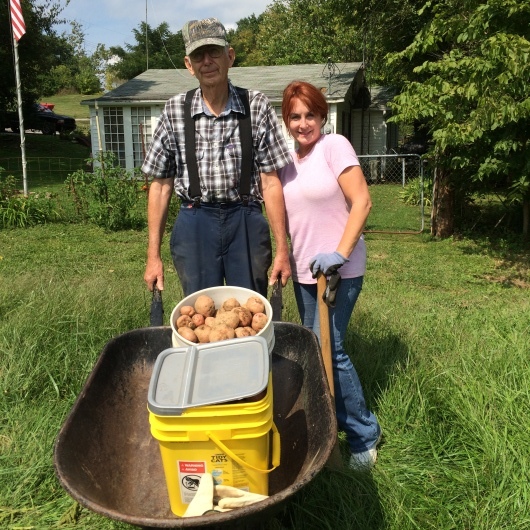 My dad, who is an avid gardener, says he’s always hated digging potatoes. And as his dutiful daughter, I have to agree. I’ll probably do it again next year, but only because the blisters will have healed by then and I’ll likely have forgotten how miserable I was during the process. The whole job probably took two hours. Once I dug up the rows, we piled the potatoes into buckets. 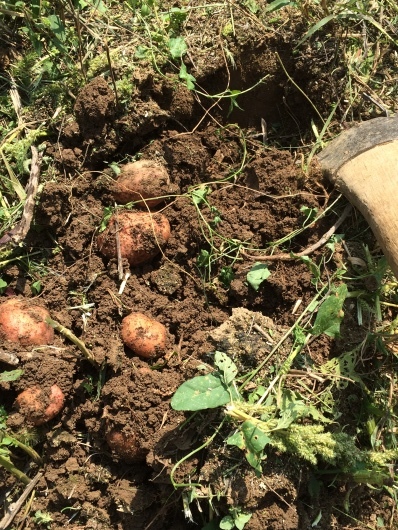 I was happy to see that most of the plants produced five or more potatoes per hill, although some of them were small. My parents helped pick through them, discarding any rotten ones. We placed the larger potatoes into milk crates so that they could cure in a dark place until they’re stored for the winter. My dad explained that a lot of people discard the tiny potatoes, but that I shouldn’t do that because there’s nothing wrong with them. We separated out the smallest ones so that I could take them home and boil them. Potatoes suffer from a bad reputation because they’re mostly consumed in the United States as French fries or as baked potatoes loaded with sour cream and butter. But they’re actually a healthy, low calorie, high fiber food with a lot of nutritional value. They’re a good source of vitamin B6, potassium, copper, vitamin C, manganese and phosphorus. They also contain a variety of phytonutrients and have antioxidant qualities. In other words, they’re good for you if you don’t fry them or drown them in butter. Taking my dad’s advice to heart, I took the tiny potatoes home that night and washed and scrubbed them. Then I tossed them into a pot of salted boiling water. The preparation was simple. Once they were cooked through, I tossed them in a small amount of butter and added fresh chopped parsley, salt and pepper. 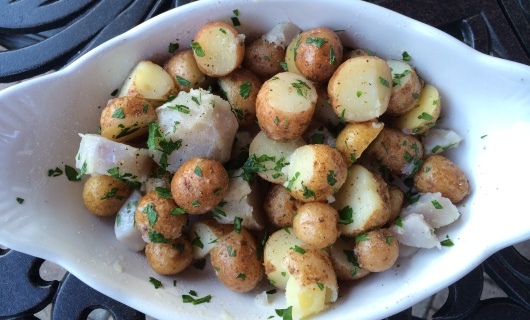 I told my husband they would be the best potatoes he’d ever tasted! And to his credit, he said they were wonderful. Posted at 11:13 am by Yummytums! Summer’s over, folks. It’s time to start enjoying cool, crisp mornings with a cup of joe and a sweet muffin. I can help you with the muffin part. 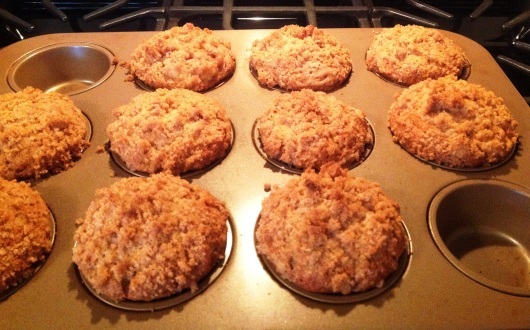 These banana crumb muffins are seriously tasty. The recipe is not mine; I found it on one of my favorite recipe sites and then adapted it to make it a little healthier. I love bananas and this recipe is a great way to use them, especially if they’re starting to get a little too ripe. In fact, ripe bananas are actually best for this. I’m usually happy with a straight-up healthy muffin, but my husband prefers a sweeter variety. I figure it doesn’t hurt to indulge every now and then. This recipe only makes 10 muffins, so they won’t last long. The original version didn’t call for whole wheat flour, but I like that addition because it gives the muffins more texture. I also use Ceylon cinnamon rather than the more common Cassia variety. Ceylon cinnamon has more health benefits, but you do have to seek it out. Cassia cinnamon is much more common and a little less expensive. But if you like the taste of cinnamon, it’s worth it to find the Ceylon variety. You can order it online or find it in some grocery stores. But if it doesn’t say “Ceylon” on the label, you can rest assured that it’s the cheaper Cassia type. I make a lot of quick breads in the fall and a bottle of cinnamon goes a long way. You might as well use the good stuff! Preheat your oven to 375 degrees. Grease 10 muffin cups, or use paper liners. In a large bowl, mix together the flour, baking soda, baking powder and salt. In another bowl, beat together the bananas, sugar, egg and melted butter. 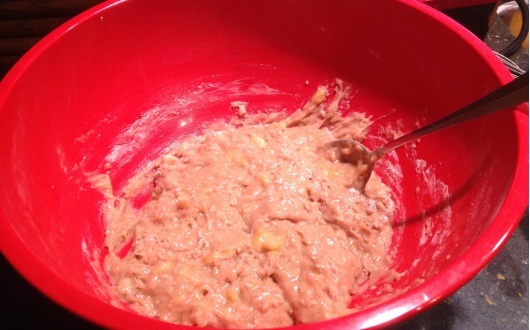 Stir the banana mixture into the flour mixture just until moistened. Spoon the batter into prepared muffin cups. In a small bowl, mix together brown sugar, 2 tablespoons flour and cinnamon. Cut in 1 tablespoon butter until the mixture resembles coarse cornmeal. Sprinkle the topping over the muffins. Bake in a preheated oven for 18 to 20 minutes, until a toothpick inserted into center comes out clean. Posted at 3:23 pm by Yummytums! Is it possible to have too much of a good thing? When it comes to fresh tomatoes, the answer is no! Still, fresh tomatoes can pile up on the kitchen counter this time of year. If you’re experiencing this same issue of happy abundance, give this recipe a try. It’s a tasty way to put those extra tomatoes to use. Plus, it makes a quick and healthy lunch or dinner. We grew several different varieties of tomatoes this year at our house and the plants have been extremely fruitful. You can use any variety of tomato for this recipe, or a combination of several. The end result is a rich tomato soup, flavored with roasted garlic and basil. 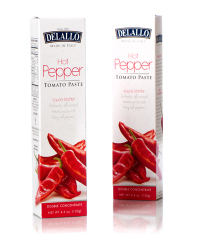 My husband and I enjoy spicy foods, so this was a good opportunity for me to use DeLallo hot pepper tomato paste, which gives the soup a little extra kick. But you can use any type of paste. Start by washing the fresh tomatoes in cool water. Preheat your oven to 375 degrees and line a baking tray with aluminum foil. 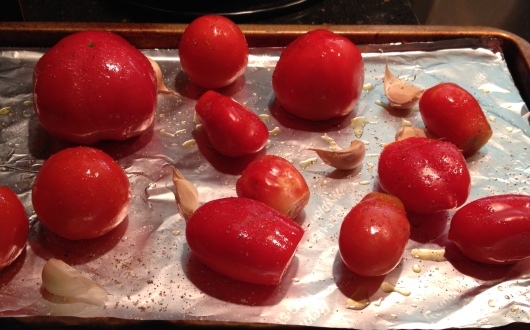 Place the tomatoes on the tray, along with the garlic cloves. Coat them in the olive oil and sprinkle with salt and pepper. 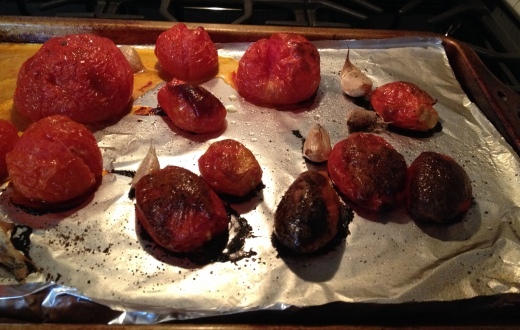 Roast the tomatoes and garlic for one hour; they will become charred and the garlic will soften. Meanwhile, roughly chop the fresh basil. I removed most of the skins from the tomatoes before placing them in a high speed blender, but you don’t have to do that. Snip the ends of the garlic cloves and squeeze the garlic into the blender or food processor. Add all of the drippings from the pan, the chopped basil and the chicken stock. Add the tomato paste and balsamic vinegar and puree until smooth. Check for seasonings and add salt and pepper to taste. You can serve this soup hot or cold. Posted at 3:35 pm by Yummytums! Looking for a sweet — and healthy — green smoothie? I guarantee this one will fit the bill. You won’t taste the “green” at all, just the sweet blackberries and the apple juice. 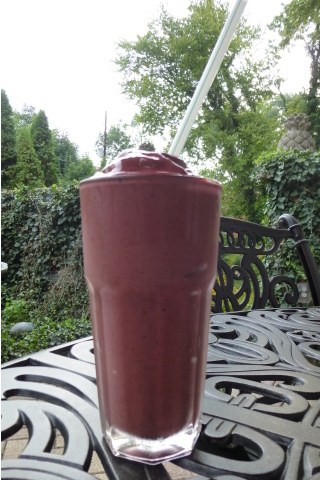 I made this smoothie last weekend from blackberries given to me by a friend. 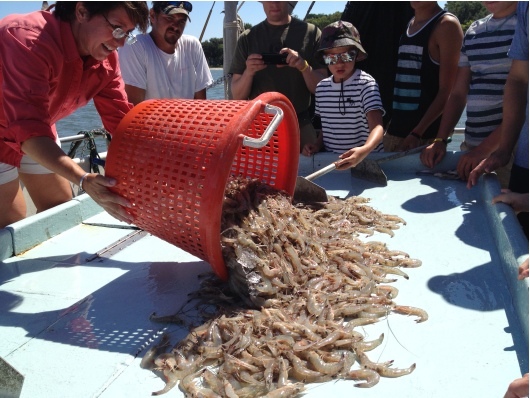 They’re plentiful right now in the south, so give it a try! You can add ground flax seed and even a handful of raw unsalted almonds, for a little extra nutrition. If you’re using a high-speed blender, the almonds will be completely pulverized. Place the apple juice, spinach, flax seed, fresh fruits, almonds and frozen fruits in a high speed blender. Blend until you reach the consistency you desire. You may need to add extra water or ice. This smoothie is a gorgeous purple color and is sweet enough without the addition of honey or other sweeteners. Posted at 1:06 pm by Yummytums! I realize that it’s the middle of summer. But in my own way, I’m preparing for fall. 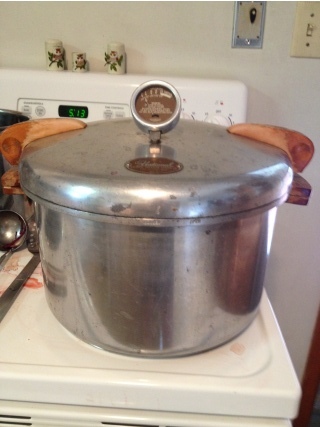 Last weekend, my mom and I canned chicken soup, which has to be one of the most comforting cold weather foods. 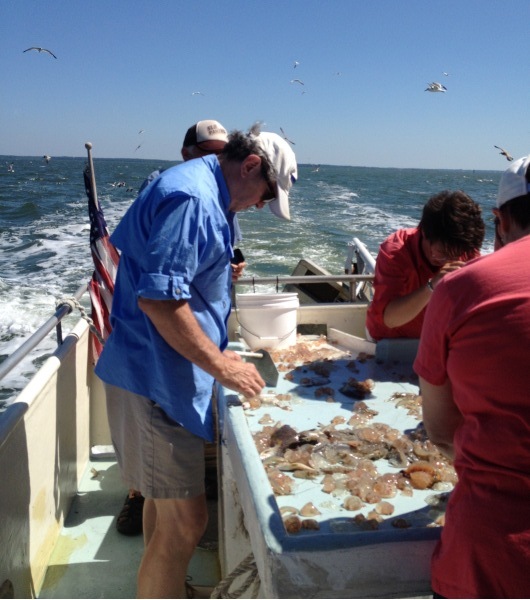 It wasn’t difficult and we were rewarded with seven quarts of tasty – and healthy – chicken soup. I like knowing what’s in my food. That usually means that I make it myself using unprocessed ingredients. Plus, food made from scratch just tastes better. That’s certainly the case with this recipe. Homemade chicken soup tastes almost nothing like the canned variety. I don’t go so far as to make my own broth, but I do use an organic, fat-free version. If you’re feeling ambitious, you could certainly make your own broth. Roast one or two chickens or a combination of one whole chicken and several chicken breasts. You’ll want to have at least 3-4 cups of chicken meat. 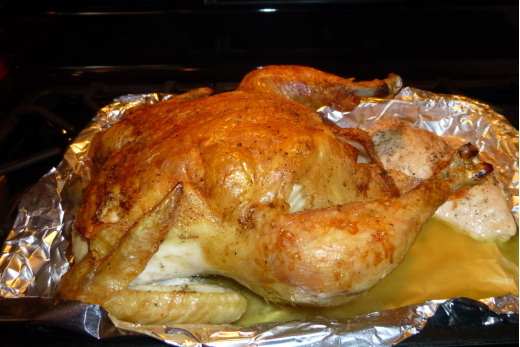 Once the chicken has cooked and is cool enough to handle, remove the meat, discarding the skin and bones. Dice into large chunks. 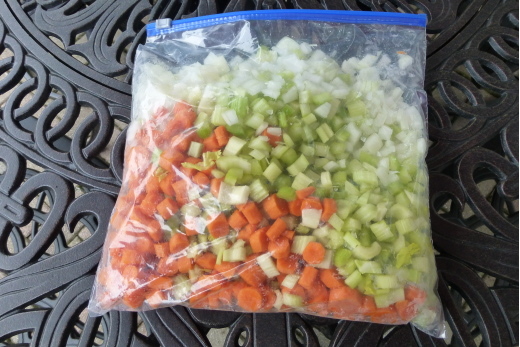 Cut at least four cups of carrots, three cups of celery and two cups of onions. I left the vegetables on the larger size to ensure that they didn’t get too soft during the canning process. You’ll need a total of eight quarts of chicken broth. If you want to add extra flavor, you can add six cubes of chicken bouillon. Add the diced meat, vegetables, broth and bouillon (if using) to a large stockpot and bring to a boil. Stir well. Reduce the heat and simmer on the stovetop for 30 minutes. Season with salt and pepper to taste. Meanwhile, prepare your jars, lids and rings. You’ll want the jars to be warm before you transfer the soup into them. My mom and I do this by placing the clean jars into a toaster oven set to “warm.” Make sure the rings and lids are also sterilized; you can do this by placing them in a warm water bath on top of the stove. Posted at 2:24 pm by Yummytums! Summer and sweetcorn are inseparable in my mind. What backyard barbecue doesn’t include this staple, which appears in abundance this time of year? Buying ears of corn at a grocery store or a farmer’s market is one thing. But picking it off the stalks in your own cornfield is quite another. I discovered this first-hand when I decided to grow my own corn. It was a process that began with much enthusiasm. 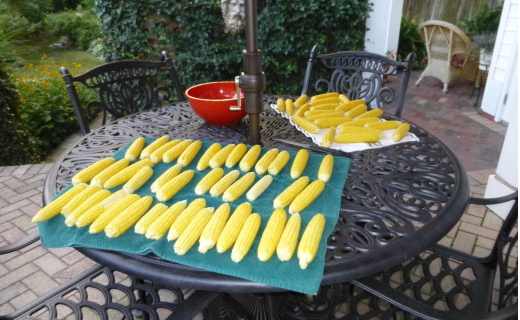 I headed down to my local Southern States in early spring to buy the seeds and – with the help of my parents – planted two rows of early sweetcorn. I watched the stalks grow and the ears develop. Then, seemingly overnight, it was time to harvest. Mother Nature really outdid herself. I gathered an entire wheelbarrow full of corn on my first pass through the garden, more than 160 ears. Mom and dad helped shuck it and remove the silks, which is the first step in preserving the harvest. Unfortunately, I started late in the day, which turned out to be a mistake. 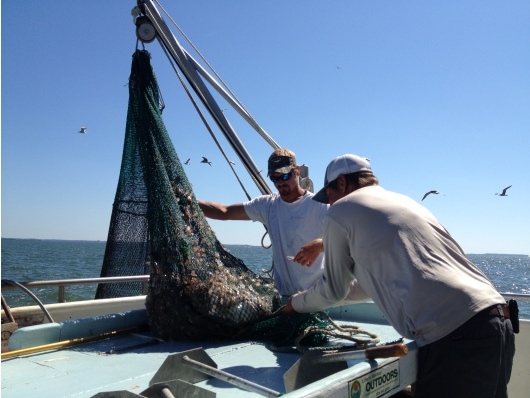 Shucking and removing the silks is only the first step. 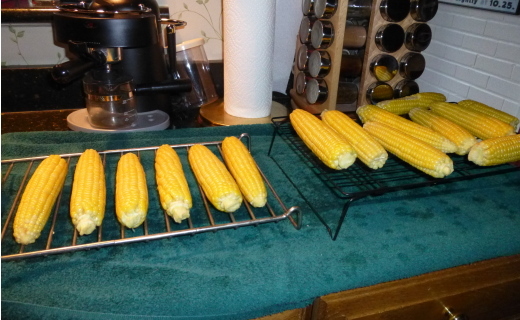 I decided to cut the corn off the cob and freeze it in freezer bags; I don’t have room to store whole ears. And while I started the process with gusto, I admit that I was exhausted by the time I finished at 10 p.m.! As is often the case, though, it was worth the effort. Here’s how you prepare sweetcorn for the freezer. It’s basically an assembly line process. First, you need to shuck and clean the corn. Then start a large pot of boiling water on the stove. Prepare an ice bath in a large pan or a clean sink. 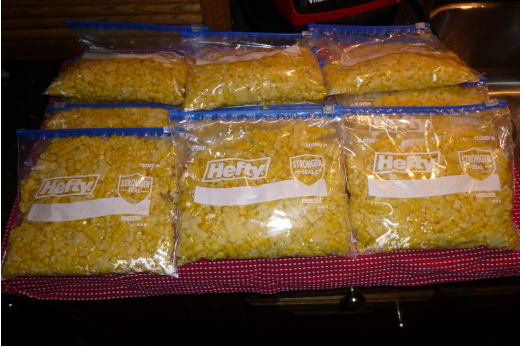 You should also place racks or towels in a location where you can let the corn dry after you remove it from the ice bath. Drop the ears into the pot of boiling water for approximately six minutes, then place them into the ice bath to stop the cooking process. Blanching basically halts the sugar-converting enzymes in the corn and helps maintain that sweetcorn flavor after freezing. Once the ears have cooled, move them to racks or place them on towels to dry. This is the easy part. For me, the most difficult part was cutting the corn off the cob. I set up my operation outside on the deck because — believe me — this is a messy process. By the time I was done, corn was everywhere, including in my hair! 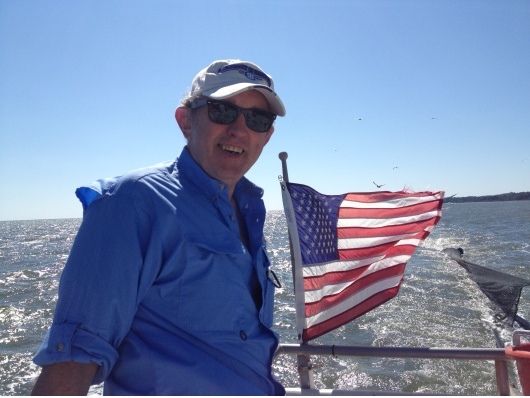 As I cut the corn off the cob, I thought about my father. By the time I had handled more than 100 ears, I was tempted to get sloppy, leaving some kernels and just discarding the cob. I was tired and the process had truly become a chore. But I felt guilty about this because of the way my father approaches this task. Having grown up in eastern Kentucky where his family lived off what they grew, he learned to be meticulous about getting every single kernel off the cob. “Waste not, want not,” is his mantra. I tried to keep that in mind as the job became tedious. I know that some people use a cutting board and cut down the cob, but I did it the way my father taught me, holding the ear with one hand and cutting from the small end to the larger end. I managed to get through 160 ears with only one minor knick. 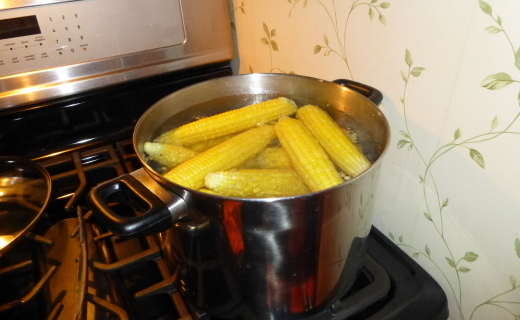 At the end of the evening, I was rewarded with 14 quarts of sweetcorn. I packed them away in my freezer to enjoy when summertime passes away and the flavor of fresh sweetcorn is a just a tasty memory. Posted at 4:00 pm by Yummytums! My mom and dad always grow a large garden and most of the time it produces much more than we can actually eat. When I was a child, visitors to our house would usually leave with at least one bag of fresh produce during peak garden months. Often, that included massive amounts of zucchini. One year in particular, we were awash in zucchini and couldn’t find enough people to take them! But for whatever reason, my mom loves these plants and continues to grow them. While her zucchini isn’t yet ready, I’m anticipating another bumper crop this year. Of course, mom is not alone. The owner of our favorite Mexican restaurant in town is also an avid gardener. We often talk about gardening as my husband and I sit down to our weekly Mexican meal at his establishment. Last week, he offered us a bag of zucchini, freshly plucked from his garden. Turns out that my parents aren’t the only ones who offer up produce. Luckily, I really like this vegetable. It’s versatile; it freezes well and it’s also good for you. It’s low in calories and just one cup of zucchini contains up to 10 percent of your daily recommended allowance of fiber. It’s also a good source of vitamin C, folate and potassium. A few years ago, I came across this recipe for “Mom’s Zucchini Bread,” on one of my favorite recipe sites, Allrecipes.com. It’s one of the highest-rated zucchini bread recipes on the site and with good reason. It’s seriously tasty. This is my go-to zucchini bread recipe for those times when you have lots of this summer squash on hand. I’ve decreased the sugar content a bit from the original recipe, but everything else is the same. This recipe makes two loaves — one for you and one to share. Preheat your oven to 325 degrees. Grease and flour two 8″x4″ pans. Peel your zucchini and grate it into a bowl. I used a hand grater for this. One large zucchini or two small ones will easily yield two cups. Sift the flour, salt, baking powder, baking soda and cinnamon together in a bowl. In a separate bowl, beat the eggs, vegetable oil, sugar and vanilla extract together. A hand-held whisk works fine for this. Add the sifted ingredients into the creamed mixture and stir, just to combine. 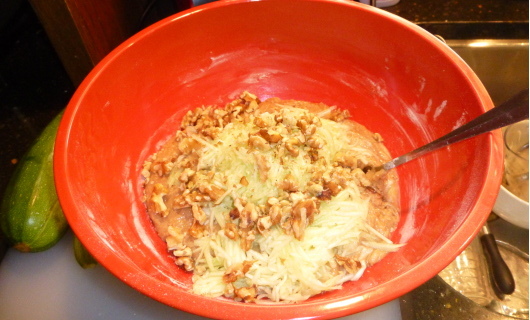 Stir in the zucchini and walnuts until combined. Pour the mixture equally into the two prepared pans. The batter will be fairly thick. Bake for 40-60 minutes or until a tester in the center comes out clean. Cool in the pans on a rack for 20 minutes. Remove the bread from the pans and cool completely. Posted at 2:53 pm by Yummytums! Last winter was so long and bitterly cold that by the time March arrived I felt as though the seed packets at my local garden center were practically begging me to take them off the shelves. Spring fever is brutal in its own way. Of course, I obliged and purchased packets of radishes, sunflowers, greens and beets. Never mind that I had no experience growing beets. I like them in smoothies, so I figured why not grow my own and can them? My father had promised a large garden plot to me and one of my brothers, so I knew that I had plenty of space to plant whatever I wanted. At the first opportunity, I planted the tiny beet seeds in one long row. And the seeds are miniscule, by the way. It’s nearly impossible to sow them without getting them too close together. I was happy to find that the beets grew like crazy! They seemed to shoot up overnight. When they were a few inches tall, I thinned them and basically ignored them for a few more weeks. This past weekend, it was time to harvest. My brother and I had our arms loaded down with beets. Preparing them for canning is not difficult, but it does take time. First of all, beets are very easy to grow. They require little care, other than thinning and keeping the weeds out. They like cooler weather, so you can sow the seeds directly into the soil one month before the last spring frost date. Thin the seedlings to 3-4 inches apart. 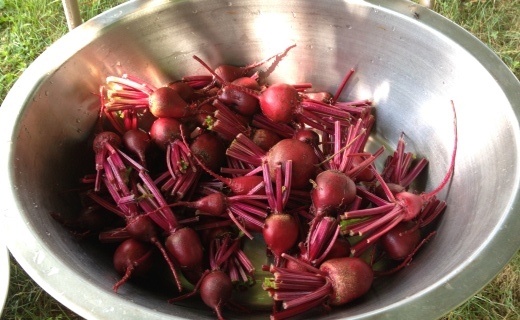 Pull the beets when they’re approximately 1 ½ ” in diameter. On the day you harvest them, heat a large stockpot or pan of water on the stove. You’ll need this when you’re ready to drop your cleaned beets into it. Prepare your canning jars. I used pint jars and my mom and I placed the clean jars into a toaster oven set to “warm” to hold them until we were ready to fill them. Place your lids and rings in a hot water bath in a small saucepan on the stove. Cut off the beet greens, leaving approximately two inches of the stem attached. Leave the tap root attached as well. This will keep the beets from losing their brilliant crimson color when they’re dropped into the boiling water. We took small vegetable brushes and scrubbed the beats clean, changing the water as necessary. 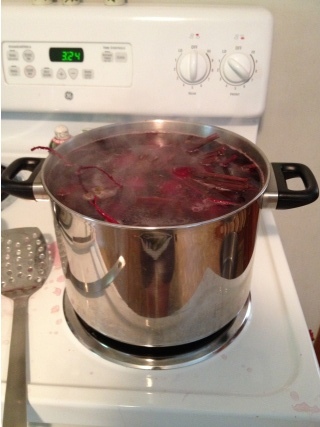 Once the beets are clean, drop them into the stockpot of boiling water and let them boil for approximately 20 minutes. Test them periodically to see if you can easily peel off the skin. Transfer the beets to a pan of cold water to stop the cooking process and peel the skins. Cut off the remaining stems and the tap root. Smaller beets can be left whole, but large ones should be cut into several chunks. Next, fill the warm jars with the beets, leaving approximately 1/2 inch of headspace. Top each jar with ½ TSP canning salt if you’re using pint jars and 1 TSP if you’re using quart jars. Ladle clean hot water into each jar. Dry off the rims and top with the lids and rings. Place the jars into a pressure canner and bring the canner to 10 pounds pressure. Maintain that pressure for 25 minutes. Carefully remove the jars to a heat-proof board or countertop and let them sit undisturbed for 12 hours to allow them to seal and cool. 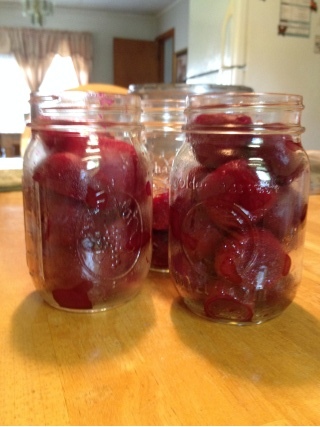 As I mentioned earlier, growing and canning beets is an easy process, but it does take time. Still, I enjoy the taste of beets and I love to use them in smoothies. They’re also quite nutritious and sweet. And believe me, fresh beets taste nothing like the canned versions that you buy in grocery stores. I also like to know that my food doesn’t contain strange addititives and is grown organically. There’s no better way to assure this than to grow your own. In addition to the beet root, you can use beet greens much as you would use Swiss chard or spinach. In fact, beets are in the same family as chard and spinach. They have an impressive list of health benefits. Beets are said to help purify your blood and liver and assist with the detoxification process. They’re high in vitamin C, fiber and minerals and they contain phytonutrients that may help ward off cancer. They can also help reduce resting blood pressure. If you’re watching your weight, beets are a good choice because they’re low in calories, even though they’re quite sweet. Heck, the Romans even used them medicinally as an aphrodisiac! Here’s what I plan to try this weekend: Beet, Banana & Raspberry Smoothie, from Lovebeets.com. Posted at 11:42 am by Yummytums! Parsley: it’s not just for garnish! True, it’s one of the world’s most popular herbs, but it also has an impressive nutritional profile when eaten fresh. Parsley is packed with volatile oils that can help prevent oxygen-based damage to cells and it’s rich in vitamins C and K. It’s also a good source of folic acid, iron and copper. Oh, and it can help you fit into those jeans, if you need to drop a little water weight. Fresh parsley is a natural diuretic. Combined with blueberries in this smoothie, it tastes great and packs a solid nutritional punch. Like parsley, blueberries have an impressive antioxidant profile and may even help break down belly fat, thanks to their polyphenols. If you’re worried about the taste of this much parsley in a drink, don’t be. It’s actually quite mild and I think it can best be described as tasting fresh. I used flat leaf Italian parsley in this smoothie, but you could also use the curly variety. The banana and mango help keep this drink on the sweeter side. But if you crave extra sweetness, add a teaspoon of raw honey to the mix. 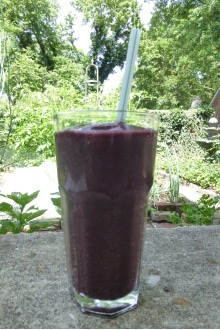 Thanks to the blueberries, this smoothie is a beautiful purple color. Add water, washed fresh parsley, fresh fruits, frozen fruits and ice to a high-speed blender. Blend for 30 seconds or until you reach the consistency you desire. Posted at 1:37 pm by Yummytums! Summertime just begs for a refreshing beverage! If you’re trying to stay on the healthy side of things, this smoothie is a great option for you. It’s packed with fruits and greens, plus a sprig of mint. Since I’m a Kentucky girl, the mention of mint automatically conjures images of mint juleps. But — aside from that tasty alcoholic beverage — mint actually has some nice health benefits that make it appealing to use in green smoothies. It has a unique ability to soothe indigestion and even ease headaches. Since it’s a natural stimulant, it can also help combat fatigue. And if you’re like me and planted a small herb garden this year, chances are that you have an overabundance of mint! This is a great way to use some of it. This Mango & Mint Green Smoothie is a perfect summertime choice because it’s hydrating, thanks in large part to the cucumber and Romaine lettuce. Cucumbers are 95 percent water and can help rehydrate the body. They’re also a good source of B vitamins and are sometimes used as hangover cures. So if you’ve had one too many mint juleps, eat a few slices of cucumber before going to bed! Like cucumbers, Romaine lettuce also has a high water content, but that doesn’t mean that it lacks nutritional value. Romaine lettuce contains protein, calcium and is rich in B vitamins. It’s also a good source of minerals such as copper, magnesium, manganese and potassium and, as a side benefit, it’s low in calories. Romaine lettuce also has a mild flavor, so if you’re new to green smoothies it’s a good choice for you. And now a word about mangoes: mangoes are often called a superfood or the “king of fruits,” because they’re nutritionally rich in vitamins, minerals and antioxidants. They also taste great and work well in smoothies because of their texture. I sometimes buy fresh mangoes when they’re on sale, and I just as often regret buying fresh mangoes because I have a terrible time getting to the fruit. I’ve read posts about the best way to peel a mango and cut out the fruit, but I always end up aggravated by the process. I’m pretty sure it’s user error. But it’s a whole lot easier for me to buy a bag of organic frozen mango chunks and they’re readily available in almost any grocery store. Fresh or frozen works equally well. There’s no need to peel the apple for this smoothie, just wash it and core it, then cut it into chunks. As always, I recommend buying organic apples if you can because the peel contains most of the fiber and antioxidants. Place all of the ingredients into a high-speed blender, starting with the water and fresh ingredients and ending with any frozen fruit and ice. Blend for 30 seconds or until you reach the consistency you desire. Posted at 1:46 pm by Yummytums! During strawberry season in Kentucky, I often arrive home to find a quart of fresh strawberries nestled behind a pillow on a chair on my front porch. A local attorney — who also loves strawberries and obviously has a generous spirit — leaves them for me and my husband as a sweet surprise. And sweet they are! There are few things as tasty as fresh local strawberries in the peak of their season. I put a handful or two in plastic baggies and take them to work with me as snacks. I top green salads with them, freeze them for later use in smoothies and I occasionally make this easy and yummy strawberry crisp for two. Preheat your oven to 375 degrees. Slice the strawberries and divide them equally into two ramekins. Drizzle the strawberries with balsamic vinegar and vanilla extract. Sprinkle them with a pinch of salt. In a saucepan on top of the stove, melt the butter and then add the oats, brown sugar and cinnamon and mix well. 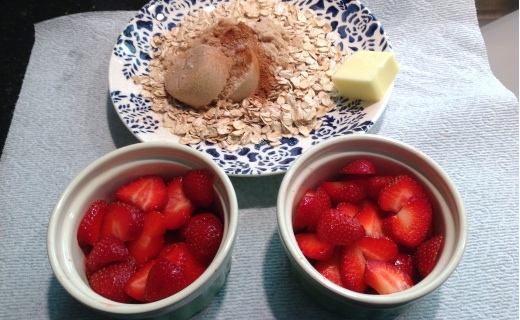 Top the strawberries with the oat mixture and bake for 20 minutes. Posted at 2:57 pm by Yummytums! Every now and then, your body just needs a break. Maybe you’ve over-indulged in rich foods or you just feel bloated or nauseous. That’s a good time to whip up a detox green smoothie using ingredients that are easy on the stomach and that help your body eliminate toxins. This pineapple detox green smoothie is a good choice. It’s mild and fresh-tasting and packed with healthy fruits and vegetables. It also contains a grating of fresh ginger, which is a rich source of antioxidants. Ginger has been used for many years to treat stomach upset and even chemotherapy-induced nausea. You can buy fresh ginger root at almost any grocery store and it keeps for a long time in the freezer. Just pop the whole unpeeled ginger root into a freezer bag and pull it out when needed. It actually grates well from the frozen state and I don’t even bother to peel it. This smoothie also contains pineapples, a good source of vitamins C and B6, manganese and copper. Pineapples also contain bromelain, a group of digestive enzymes that have anti-inflammatory properties. If you like your smoothies on the sweeter side, you can add a teaspoon of raw honey. Raw honey is just honey that hasn’t been pasteurized or processed and it still contains its natural enzymes and other nutrients. I found my jar of raw honey at my local TJ Maxx location, but any health food store should have it. As always, I recommend buying organic whenever you can. Add all ingredients into a high speed blender, ending with the frozen ingredients. Mix thoroughly until you reach the consistency you desire. Posted at 10:22 am by Yummytums! Every now and then, I drag out my wok and try a new recipe. I’m not a fan of heavy sauces, so this one seemed like a good fit. And I do love coconut milk. This recipe is easy to pull together if you already have the ingredients in your pantry. Once the prep work is done, it comes together quickly. 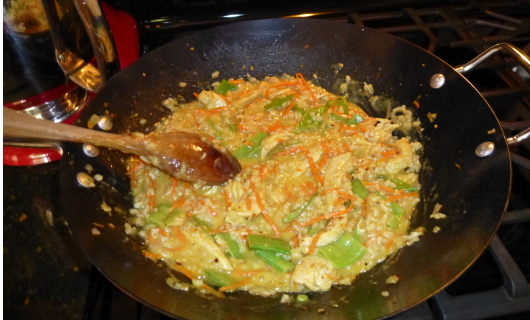 Plus, it’s a great way to use left-over cooked rice and fresh vegetables. Be forewarned, though, it’s spicy! Of course, you can take the spice down a few notches by reducing the amount. You can also substitute other vegetables such as chopped broccoli, cauliflower or mushrooms. Just use what’s in your fridge. Melt the butter in your wok or large skillet. Add the chicken and cook for 2 minutes, then add all of the spices: cumin, garlic, ginger, red pepper flakes, cinnamon and curry powder. I also added a sprinkling of salt and pepper at this point. Continue to cook, making sure that you stir often so that the garlic doesn’t burn. Once the chicken is mostly cooked through, add the olive oil and all of your vegetables and continue to cook until the veggies are crisp-tender. Add the cooked brown rice, honey and coconut milk and heat through. You may need to adjust the salt and pepper at this point, as well.